In Aquinas, Ethics, and Philosophy of Religion, Thomas Hibbs recovers the notion of practice to develop a more descriptive account of human action and knowing, grounded in the venerable vocabulary of virtue and vice. 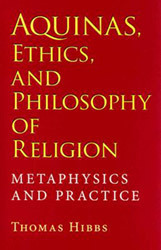 Drawing on Aquinas, who believed that all good works originate from virtue, Hibbs postulates how epistemology, ethics, metaphysics, and theology combine into a set of contemporary philosophical practices that remain open to metaphysics. Hibbs brings Aquinas into conversation with analytic and Continental philosophy and suggests how a more nuanced appreciation of his thought enriches contemporary debates. This book offers readers a new appreciation of Aquinas and articulates a metaphysics integrally related to ethical practice.